Download Interface 3 for free, search for the free version on App Store. 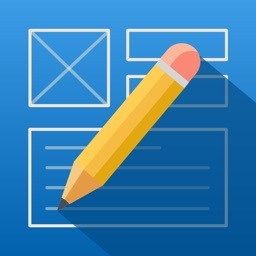 Interface, the original and #1 native prototyping app on the App Store. 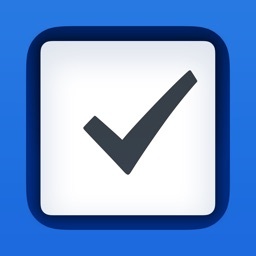 Interface 3 is here with full iOS 7 support. 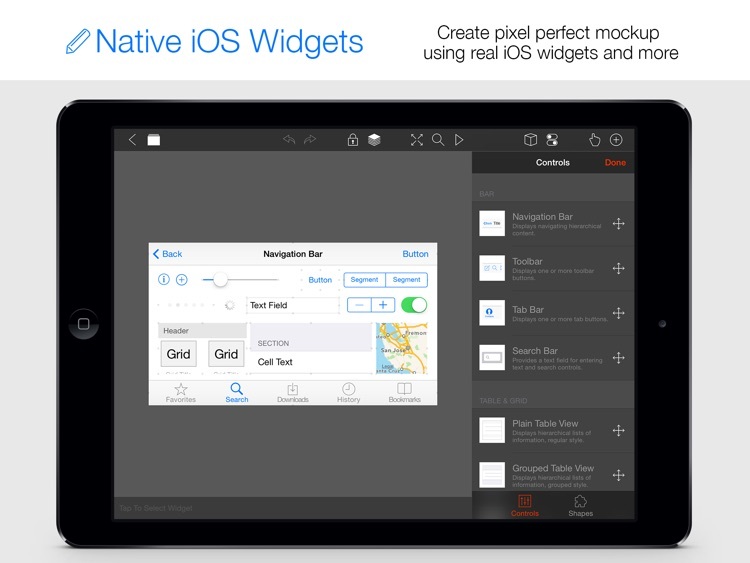 Use Interface 3 to create pixel perfect mockup of your iPhone or iPad app using native iOS widgets, right on the the iPad. 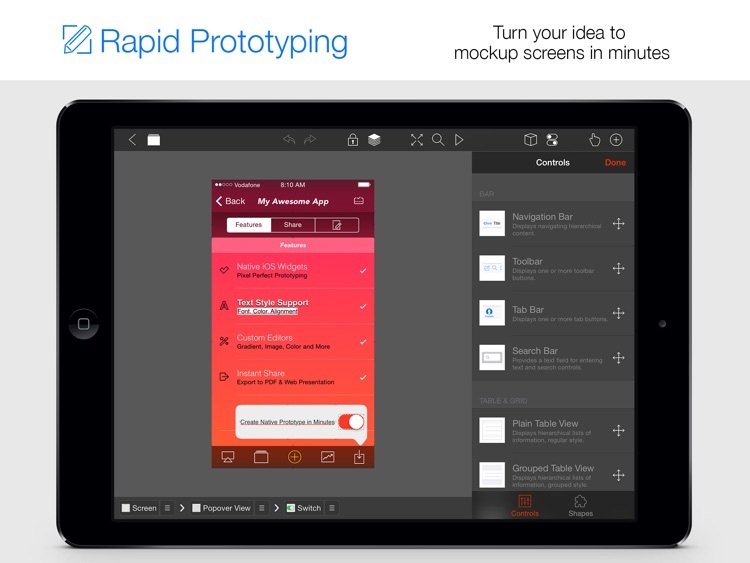 Imagine how much time you will save if you can create a mockup of your iPhone or iPad app, right within your iPad? 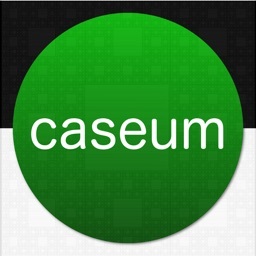 Even better if you can instantly try out your mockup with real native iOS controls? Now you can, with Interface 3, the ultimate mockup & prototyping app for iPad. We believe iPad itself is the best place to create mockup for an app, because you can hold the device on your hand and actually try out the mockup. This is why we created Interface, the Interface Builder(or even better) that runs right within your iPad. Interface covers all iOS widgets, and it follows guidelines suggested by Apple when creating widgets to achieve pixel-perfect results. Our free cloud based Web Presentation export service will convert your entire project into playable presentation that can be viewed in all modern browsers, sharing your ideas has never been this easy! Interface's powerful layout engine allows you to customize almost everything provided by the iOS SDK, with zoom support and layout assistant, fine tuning widgets is easier than before. 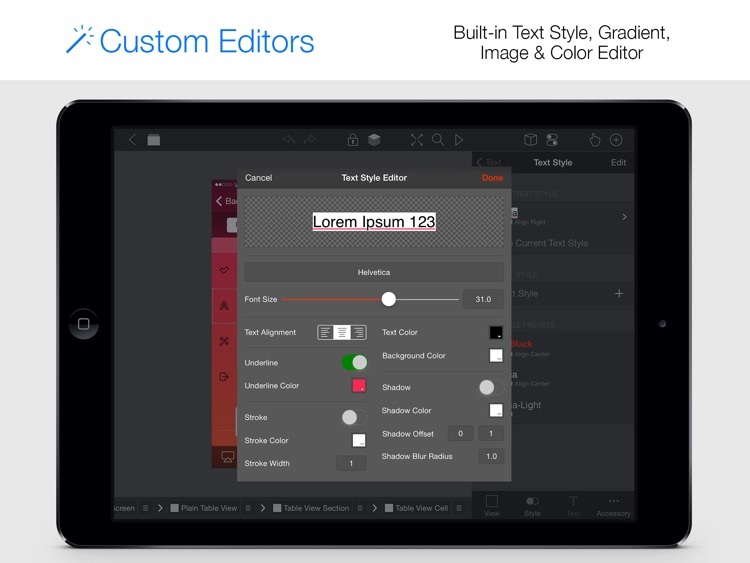 Interface features many built-in custom editors such as Text Style Editor, Color Editor, Gradient Editor and Image Editor. 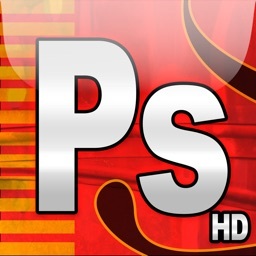 Ever wish you can change an icon's color without leaving the app? Now you can with the built-in image editor. 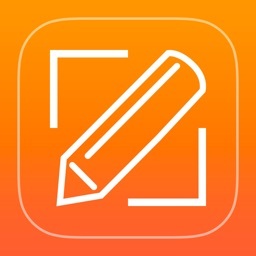 iOS 7 is all about contents and texts, Interface 3 provides full text styles support, simply define a text style, choose the desired font, color & more, then apply it to widgets in one simple tap. 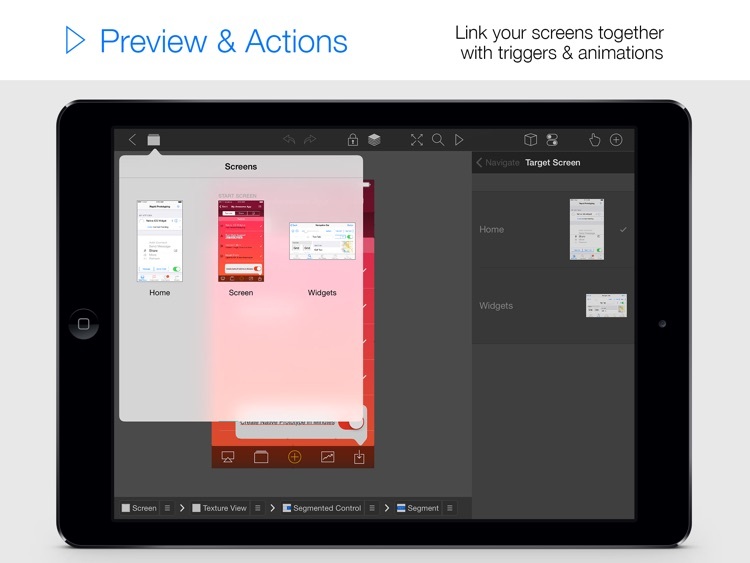 Preview your app flow right within Interface, or export the project to Web Presentation and share it to anyone. Export your project to a multi-page PDF to share with anyone, with built-in File Sharing & Airport support, you can instantly open your PDF in compatible apps such as Drop Box, Box and Google Drive. We've handpicked a list of high quality iOS 7 style stock icons & patterns, installation is just one tap away. With over 5000 free icons you can always find the right one. 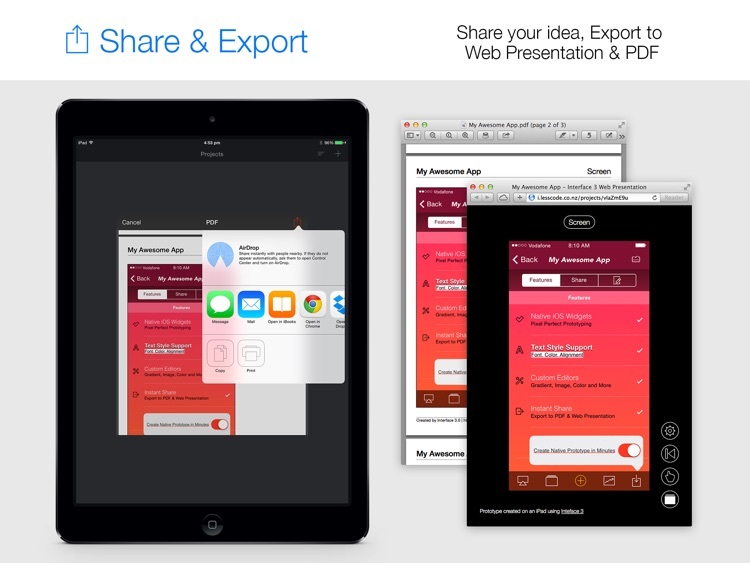 You can also bring your own project images to Interface via iTunes File Sharing or Drop Box. Retina support, orientation support, alpha, popover, password protected project, visit http://interface.lesscode.co.nz for extensive screencasts and information.